I love this space from Holly Becker of Decor8, with its pink overdye rug. The photo appeared in her book, Decorate Workshop. And Maxwell Gillingham-Ryan of Apartment Therapy has a hot pink rug, too. This was his living room, featured in Apartment Therapy’s Big Book of Small, Cool Spaces. You see what I mean about design bloggers and pink rugs? Maybe we’re an odd bunch, but I love the look. I just wish I’d known better than to choose cotton for a busy living room in a house with two young kids, a dog, and three cats — though in my defense, we didn’t have children at the time. I’ve been looking at wool rugs for a possible replacement (maybe? ), and I keep coming back to pink. Here are some of my favorites. This is my rug. It can be ordered in custom colors, but when I came across it in shades of pink, I had to buy it. I would still recommend it, but for a room with less foot traffic. Gorgeous, and less in-your-face ombré as it appears on screen (as seen in Maxwell Gillingham-Ryan’s home, above, and repurposed in his apartment). It’s expensive though. The color looks more vibrant than pastel to me. The price is right, but the solid color is a bit plain. I like that the underlying pattern is less obvious than in some overdyed rugs. Less trendy. I would love this rug in my living room. Think it would work with my floral chair? We have a busy house hold also with cats, dogs and kids. I can relate to making mistakes with floor coverings over the years not holding up. The pink is awesome and I would love to see them paired with your colorful chair and floors. What worked for us were the flor carpet squares. I created patterns and had fun with them and picked the high traffic ones. They have held up so nicely and I still love them! Everyone always compliments them. I have FLOR in my dining room. You’re right — they do hold up well, as long as you choose the appropriate style. Nicole, the four you’ve featured are beautiful. I’m a pink rug fan! Rugsusa.com has some pretty good pink rug choices and a lot of them are currently 50% off with free shipping. We just got a rug from there and was quite pleased with the quality of the rug. Yep. That’s where the fourth one that I showed is from, and it’s on sale right now for half-off. I’m obsessed with pink carpets!!! Lately I keep seeing them everywhere. Tara Styles shows a really nice one in her YouTube yoga videos – I think it’s ABC Carpet & Home. I have that one in navy. It sheds quite a bit, but is really thick and soft. And a great deal when on sale. I love these pink rugs! Maybe one of these days, I’ll get one. We have a large wool rug from Rugs USA, and I’m thrilled with it. It does shed like crazy, but I think that’s normal, at least for the first couple of years. Can’t wait to see what you go with! Wool can shed like crazy at first. Not usually for a couple of years though! That ombre rug is GORGEOUSSSSSSS!! I thought that you had just solved my own living room rug dilemma until I saw the price…YOWZERS! I know. It would be about $5000 for an 8×10 rug. I just bought a dark pink rug for my guest bedroom two months ago and I am totally in love with it. #2 and #4 would be my favorites of the ones you picked. These are all lovely choices, yeah me too can’t wait to see what you choose. But I do have a question on the comment you threw about cotton low pile rugs not being family or pet friendly, and that you are actually looking for wool, which I thought all along was less pet friendly than cotton. I have an area rug from CB that’s cotton and all I have to do is throw it our washing machine and air dry it outside, and it’s as good as new, don’t think you can do that with a viscose, or wool or any other rug except cotton. Please do enlighten me! Cotton is great if it’s small enough to throw the whole thing in the wash. If you have to spot clean though, you can end up with rings around each spot (even if it’s just water! ), whereas wool cleans up much more easily. Plus wool stands up to dirt better — cotton just takes (and shows) it all. Oooh, love #4. I seem to always gravitate to things with texture and a little bit of imperfection. That’s what I like about it so much. Did you click over and see the full view? It’s pretty good. As a design blogger I must say you will not find any pink rugs in my home or any homes I have designed (except my granddaughter’s nursery) but that is only because I have not had the opportunity to use one yet. I do love the looks you have shared but not sure it is a choice that readily comes to mind but I will definitely add it to my “repertoire” now. Well, I’m sure that not all design bloggers have pink rugs! (Wouldn’t it be funny if we did?) I think the percentage is certainly higher than average though. I’m a total rug novice (w/ no kiddos! ), but why would wool be better than cotton? Cotton seems like an easier textile to clean, but maybe what holds true for clothing is different for rugs? I didn’t think of it that way, but I suppose it is counter-intuitive. Wool is kind of a pain to take care of for clothes, but that’s because you can’t just throw it in the washer and dryer. For carpets, it’s a better choice. #2 or #4 – love them all!! yep, it’s #4 for me as well! love it and think it would be divine with your floral chair. i have to say, that chair was a bold move & one my little monochromatic heart wouldn’t have the courage to purchase. i’m a tad jealous of your ability to go there ’cause it’s absolutely beautiful! Ya know, I never really noticed it til you pointed it out. I guess so, as I also have chosen a pink rug when doing a rough mood board for my new living room. I chose the Pink Phoenix Dhurrie Rug from West Elm. I really like some of the examples you’ve chosen and need to check them out! Great article! Just have to jump in and say that 100% wool for area rugs is the way to go. I have one in my living room (it’s a thinner, flatter weave, not one of the big thick ones I always see in PotteryBrn and the like) — it’s almost 10 years old and still looks great. Most liquid spills bead, and if you’re fast enough with a towel, will blot right up with no post-cleaning required. It wears like iron with no evidence of foot traffic – I have 2 kids, a husband and a cat. Also I am in love with pretty much everything about the first shot from Decor8. I feel like I recently became very attached to the white/wood/brass/MCM trend. I’m all over it now! I really like the living room in the third picture. The pink and orange colors really complement each other. Did you design that one? You have a gift of finding great living rooms! 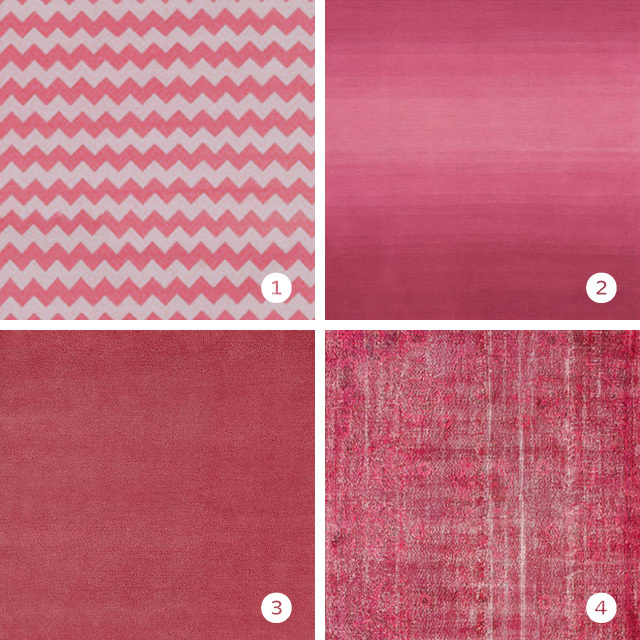 I am not a design blogger, but I have pink rugs too! I have one of those “open the front door and whoops you’re in the living room” houses, and I’ve divided the living room into two seating areas using two of this fab flatweave rug (no longer available!) from PBKids. LOVE and adore. I LOVE pink and I would love to have a pink room, but my husband HATES pink! He LOATHES pink! Fortunately he has other wonderful qualities. My favorite is the zigzag rug, but all of them are beautiful.